Easy to make foil wrapped onions are grilled at the same time your other foods are cooking. Fit the whole onions around your beer can chickens, or your grilled tri tip, and you'll have a great side dish that everyone loves to eat. The onions are cooked until the become very soft, which brings out their natural sweetness, too. This simple grilled onion recipe is made with just four ingredients, and that includes the onions! You can use any type of whole onion you like… red, yellow, white, Vidalia, or even a Walla Walla or two. They all become sweet and flavorful when cooked to a velvety soft texture. Trim off the tops of the onions, down far enough that you can see the tops of most of the layers. Could be 1/4 inch. Could be 1/2 inch. You just need to cut off enough that it's easy to dig out the core of the onion, which you'll do later. Trim off the root end of the onion, but just enough to remove any remaining roots. The bottom of the onion has to stay completely sealed. Don't want to lose any of that butter! Remove the skin and any layers that look partially dried. You want the entire onion to be tender when it's done. Now it's time for a little finesse. With a sharp paring knive, carefully remove the center of the whole onion, being sure that the sealed bottom isn't compromised. Remove enough of the core so there's room for the tablespoon of butter. Drop a half-boullion cube into the onion, then pack it with the butter. While your at it, rub some of that butter over the entire surface of the onion, too. Sprinkle with the black pepper. 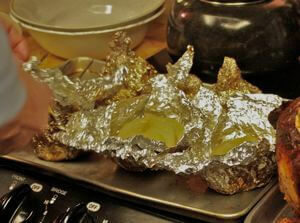 Wrap the onions individually in a double layer of heavy duty aluminum foil. 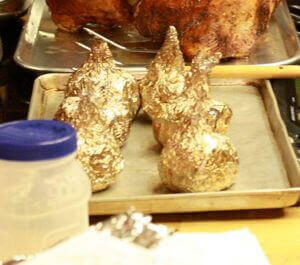 I use enough foil so I can wrap them up like a Hershey Kiss chocolate candy, with a little point at the top. Place the foil wrapped onions on your grill, either using indirect heat, or over low, direct heat. Grill for an hour, or until tender. When done, let them cool for a few minutes before opening them up. You'll find tender, sweet, buttery onions, with just enough added flavor from the bouillion cubes and pepper to make them interesting.